Matthew: "The Nagus" is fun, no two ways about it. And fun is certainly a good. But, as Aristotle might say, fun isn't the only good. So let's see where this episode succeeds and fails.I may as well start with the aforementioned fun factor. So many season one episodes have been bogged down by ho-hum plots and so-so characterization. But one bright spot has been the Quark character. Well, he's front and center here, and predictably, much fun ensues.Seeing Quark preen down the halls of the promenade as the Nagus is a treat. Getting a look at Ferengi politics is interesting. The B-story too is enjoyable, with the Jake-Nog friendship explored. Kevin: Yeah, this episode really had a great energy. It does lean more toward the fluff, but like, say Rascals, it's well-executed fluff, and as long as they don't go to this well too often, it's a welcome change of pace. I have to say, even for a fluff show, the scripting was pretty tight and the pacing was good as well. There are some issues with how the Ferengi are portrayed as an actual civilization, but accepting that as read, everyone's responses and motivations are clear and well portrayed. I also liked the scenes between Zek and Kira, almost in spite of myself. Normally, I'm not a fan of making light of sexual harassment, but both actors really committed and the scenes themselves ended up being really funny. Matthew: This story is somewhat lacking on the sci-fi front. The central idea of the B-story, that people of different species might have a hard time interacting, isn't explored very well. I like the B-story, and think it is sweet that Jake would teach Nog to read, but their ability to be friends despite different value systems is just taken too much for granted. The same goes for the exploration of the Ferengi culture we are afforded here. I just don't get it. How can the Ferengi have any commerce, if, as they say, they are renowned for cheating throughout the entire quadrant? It would seem like an insurmountable brake on their economic growth. I don't even understand how internal Ferengi commerce could work. As we are shown, family cheats family, friend cheats friend. I just can't see how a society could spring up on this basis. Kevin: I've always wondered that about Ferengi as well. Unless they have some monopoly on a vital good, who would ever do business with them? I think the problem is that kind of broad-stroke approach to the idea of how businesses actually work, kind of like the problem I think they have when portraying courtroom dramas on Star Trek. They tend to portray the popular, trope-ish understanding, and it doesn't quite live up to scrutiny. I think the better way to pitch it is that the Ferengi don't see it as cheating, per se. Their culture could take "caveat emptor" to an extreme like other Trek races embody other human traits or philosophies. If you didn't ask the right questions, it's your fault that you didn't know what you needed to, rather than a more modern human approach that compels certain disclosures or allows certain assumptions. I also think they needed to flesh out exactly how the economy functions. It's not a libertarian utopia, despite the lack of government regulation; it's more an oligarchy. Matthew: I don't really like the characterization of Rom here. I shouldn't judge it based on future episodes, but it's hard not to. Even on its own terms, this episode portrays Rom as having nascent principles with respect to returning the lady's coin purse, and previously letting Nog go to school (how could a sophisticated economy thrive with such illiteracy?). But now, he conspires to kill Quark? Something just doesn't feel right. I like that Quark absolves him at the end, labeling it a quintessential Ferengi act. But then again, that leads into all of my prior questions about the Ferengi. Kevin: I agree. I give it a pass because they're still figuring stuff out. But it doesn't quite jibe with earlier or later portrayals. I also think the literacy thing is another lost chance at really exploring an interesting aspect of future society. What if literacy isn't critical? 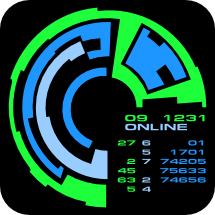 With universal translators and verbal interface, is it necessary tor read text? There's a great article I read last month that posits that the Star Wars universe is likely illiterate as there's really no other way for the Jedi to go from omnipresent to myth in less than a single lifetime unless the only way information is distributed is everyone gets their news verbally from the traveler in their local bar. Without permanent records of things people can read, information gets lost easier. So they could have portrayed a larger aspect of modern civilization. Reading is a skill, but possibly not a critical one, and Jake's presumption of literacy becomes a facet of the cultural divide. Matthew: Armin Shimerman delivers a tour de force, here. Quark shows such a range of emotions here, and each is deliciously played. His preening, his begging, his prevaricating, his nervousness, his avarice, it's all really good. Wallace Shawn as Zek? Well, it's certainly an indelible character. I imagine the voice will divide many. It was pretty annoying, to be sure. But he did come off as wily and commanding. So it worked overall. Kevin: I think Armin Shimerman may be the best single actor in history for acting through prostheses. There is something about just the way he moves his eyes that portrays a depth and range of emotion. You almost forget he's wearing a pound of latex on his face. It says something that a lot of people cite him as a favorite character because he did such a great job of connecting with the viewer. Quark is probably the most rounded, realistic character on the show, which is also a compliment, given the two-dimensional backstory for the Ferengi. If DS9's job is to portray Federation values clashing with a grittier world, there is no better actor to explore it with than Armin Shimerman. And I love Wallace Shawn. That man committed to the part. Half a dozen words in, I understood his character. He's eventually more explicitly played just for laughs, but there's a solid thread of menace beneath the doddering and he does a great job of portraying it. Matthew: Aron Eisenberg gets a nice chance to play a young, conflicted adolescent here. Cirroc Lofton doesn't blow the doors off of the room with his emotional depth, but Jake comes off as a sweet and fundamentally good kid, and I enjoyed his read on the lying scene in school. Kevin: Nog is one of my favorite secondary characters and the writing is eventually very good for him, but a lot of it for me is the acting. There's an earnestness and vulnerability that really shines. Matthew: There were a lot of Ferengi here. Thus we got to see loads of ears and face prosthetics. They all looked pretty good, I must say. A fine job was done in differentiating one Ferengi from another. I will opine that there isn't a very good progression of aging - how does a Ferengi go from looking like Quark to looking like Zek? The wardrobe was also good, especially some of Quark's more elaborate Nagus-wear. Kevin: I love the Nagus' staff. It's hilarious. I love Quark's wardrobe as well. Like Cardassian wear, it manages to produce an aesthetic that I don't necessarily like personally, is still visually interesting and not actually annoying. Matthew: In the end, although I enjoyed this episode for the most part, I don't feel it rises above a 3. It's solidly average, not bad by any means, with lots of comedy but not a lot of substance. 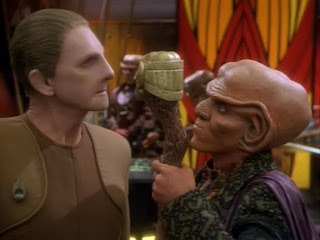 The attempts at character drama between Quark and Rom fell flat, and Ferengi society makes no sense. Jake and Nog had some nice scenes, but they were also pretty much on the fluffy side. Kevin: This is a solid 3. It's fun, well-paced, but light on substance. More than anything, I really enjoy watching this episode, a claim I sadly cannot make about a lot of episodes this season. That makes a total of 6 from us.